Things I Don't Want to Know: On Writing est le grand livre que vous voulez. Ce beau livre est créé par Deborah Levy. En fait, le livre a 129 pages. The Things I Don't Want to Know: On Writing est libéré par la fabrication de Bloomsbury USA. Vous pouvez consulter en ligne avec Things I Don't Want to Know: On Writing étape facile. Toutefois, si vous désirez garder pour ordinateur portable, vous pouvez Things I Don't Want to Know: On Writing sauver maintenant. A shimmering jewel of a book about writing from two-time Booker Prize finalist Deborah Levy, to publish alongside her new work of nonfiction, The Cost of Living. 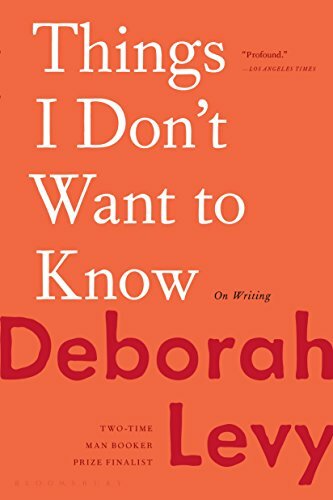 Blending personal history, gender politics, philosophy, and literary theory into a luminescent treatise on writing, love, and loss, Things I Don't Want to Know is Deborah Levy's witty response to George Orwell's influential essay "Why I Write." Orwell identified four reasons he was driven to hammer at his typewriter--political purpose, historical impulse, sheer egoism, and aesthetic enthusiasm--and Levy's newest work riffs on these same commitments from a female writer's perspective. As she struggles to balance womanhood, motherhood, and her writing career, Levy identifies some of the real-life experiences that have shaped her novels, including her family's emigration from South Africa in the era of apartheid; her teenage years in the UK where she played at being a writer in the company of builders and bus drivers in cheap diners; and her theater-writing days touring Poland in the midst of Eastern Europe's economic crisis, where she observed how a soldier tenderly kissed the women in his life goodbye. Spanning continents (Africa and Europe) and decades (we meet the writer at seven, fifteen, and fifty), Things I Don't Want to Know brings the reader into a writer's heart.